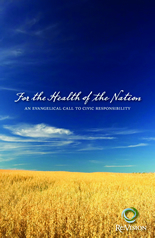 In 2004 the National Association of Evangelicals released the groundbreaking document For the Health of the Nation: An Evangelical Call to Civic Responsibility. This historic document outlines seven different areas of concern for Evangelicals engaged in politics. In an effort to make Christians more aware of this work we are taking nine weeks to highlight the importance of this document. You can read it in its entirety by clicking here. Usually, when someone talks about For the Health of the Nation (FTHOTN) all that is discussed is the seven issues that are highlighted in the last half of the document. While it’s true that those items give legs to the work, it is the philosophical underpinnings of the first few pages of FTHOTN that allows the seven issues listed later to have a strong foundation. The document begins by making the profound claim that only half of all Evangelicals in America vote, a number that is roughly identical to the rest of society. This statistic is particularly shocking in light of the theological argument they present for participation in the public square. When God created the earth He gave mankind dominion over it. Many theologians would point to this passage as the divine mandate for the creation of government, because in order to rule over and care for the earth there needs to be some form of structure, i.e. government. Jesus is Lord over every area of life, including politics. If we abandon the act of governing, the Devil will certainly fill the void left by our absence. In the interim between Christ’s Resurrection and Second Coming the Church is called to speak prophetically to society. The Bible states that government is supposed to render justice (Rom. 13:1-7, 1 Pet. 2:13-17). Christians can bring a unique perspective to helping government live up to its calling. Finally, love of neighbor requires that we participate in government, because government can act in many unloving ways if we do not engage. The remainder of the introduction to the document balances a handful of competing concerns while outlining the method with which Evangelicals should engage politics. The authors state that political action must be guided by a normative worldview rooted in Scripture and a clear factual analysis of the world around us. We must recognize the importance of personal decisions and structural changes, transform individuals and institutions, and our actions must be characterized by both humility and civility. The core of what we believe at FaithfulPolitics.org is that Christians should be engaged in the political realm, that we should have a broad, biblically balanced agenda, and that we should work for policies from the Church and the government that help promote solutions to a balanced agenda. All of these points are very well articulated in the introduction to the NAE’s document, For the Health of the Nation. The Body of Christ owes a profound debt of gratitude to the NAE and their steering committee for putting this piece together.